This week Lisa speaks with Adam Seaman. They chat about the difference between strengths and talents, as well as practical applications for your top strengths. This interview is a great introduction to what you can do with Clifton StrengthsFinder. You can reach Adam through the Talent2Strength website. He also posts helpful thought leadership on Twitter. You’ll definitely see his Intellection in action. Another fun research is the Talent2Strength Strengths Shop, where you can find wearable StrengthsFinder merchandise like mugs, t-shirts with your Top 5 talent themes. Lisa Cummings: This episode is about stepping back and understanding: what the tool of StrengthsFinder is, and what is it like for a team. Let’s start with your opinion on why it is so awesome. Adam Seaman: Great. My goal is to get other people as excited about it as I am. I don’t always reach that goal of course, but it’s the striving for it, and sometimes I succeed, and I call it “green lit” when I get somebody as excited about it as I am. StrengthsFinder stands out to me; one of the reasons is that it really gives that language that people can describe themselves with. I hear this all the time. It’s like, “oh I always knew I had that quality, but I didn’t know there was a name for it.” Then they’ll say, “and I didn’t know other people had it or didn’t have it, I just assumed everybody was like me.” Those are some of the reasons why I really like this tool. The other is that it really dials into the individual, so instead of it being “I’m one of four colors”, or “I’m one of 16 letter combinations”, you have one in 278,000 chance of somebody having the same top five themes as you have. Those are just some of the reasons I really, really like this tool. Lisa Cummings: That’s so crazy. Any time I cite that number or the chances that someone else will have the same top five talent themes in the same order as you is 1 in 33 million. That just blows people’s minds, and they think, “Okay, so this isn’t going to be a training where you come into my team and talk to people about the four boxes you can put them in.” It makes people so receptive to StrengthsFinder compared to other tools. Adam Seaman: Yeah, I think it really makes them go, “Alright, this is serious, serious, stuff here. It really does dial into the individual.” But then, it does create a little bit of a barrier because there are 34 themes that it measures you on, and learning all 34 is more daunting than learning four colors or something like that. That’s definitely one of the challenges for people – to really access this tool deeply. But once you do…and this gets into another thing I really love about this…is most assessments you read it and you’re like, “Alright, I guess that’s accurate, I guess that describes me, and then what do I do with it?” You file it away because you don’t want to throw it away, but what do you do with it? So you just file it away, and that’s the real shame that I try to correct with StrengthsFinder. Lisa Cummings: [laughing] You give them strength shamings. Adam Seaman: [playing along] I do. I just shame them. If I’m in a grocery store and somebody is like, “Hey, I just took the StrengthsFinder” you know, as people do when they’re in the grocery store. Lisa Cummings: [jokingly] Definitely. When you’re picking out butter. That’s when I do it. Adam Seaman: Yes, it’s in the butter aisle. Lisa Cummings: So to get back to serious stuff for a second, you said something about a personality assessment kind of notion, and so for people less familiar with StrengthsFinder, they often assume this is a personality assessment. I know that you view it in a different way, that you look at StrengthsFinder as so much more than that, as do I. So tell us about how you get people beyond that basic view of it. Adam Seaman: For me what this captures is this idea that we all live in our own self-world. Lisa, right now you’re in your office in Austin, Texas, your side of the world. You have your experiences going on, the things that are happening inside of you. Then I’m over here in Tulsa, Oklahoma. I have my own concerns or issues or things I’m thinking of. So we’re kind of in our own self-world. That’s actually the term for this, it’s a German word, and a German biologist came up with this word. It’s called umwelt, which is kind of a cool word. Adam Seaman: It’s U-M-W-E-L-T. So it kind of roughly translates to this idea of self-world. For me what I love about StrengthsFinder is it helps describe what’s happening in your own self-world. In my head, and in your head, we both share the Strategic Talent Theme, so we’re always playing through if-then scenarios. We do it so fast, that we don’t even know we’re doing it. What would be really interesting if this were possible, is if somebody else who didn’t have Strategic very high at all were to somehow transplant into our heads, kind of like a Freaky Friday kind of thing, then they were to have to get into our heads, or just take your head with Strategic and Maximizer. They’re going to have this flurry of thoughts coming at them at such a high rate of speed; it’s just going to be overwhelming for them. It’s cool to realize that within each person, there’s a whole lot more going on than what we ever could tell, or even just ask them about. It’s like if I know your top five themes, and I know your number three is Positivity, which it is, I know that your knee-jerk reaction is going to be to look for the upside of things. It’s what shows up when you show up. So it’s kind of cool as you were talking about the power StrengthsFinder brings, I was thinking man you could almost turn that into an application exercise where you’re trying to do it as if you had Adam’s invention. Now that you’re telling us this with Futuristic number 10 and Ideation number 3, why don’t we get you to share with the listeners what your top 10 talents are, or at least the ones that you resonate with most. Then they can get a feel for, if they’re new to StrengthsFinder, what these words even sound like…and how do people resonate with them before they even know the definitions. Adam Seaman: Before I do that, I just wanted to riff on a point that you made. I’m using musical terms, because I know you’re a musician, and I have like two musical brain cells and they don’t even talk to each other, so I’m not a musician but I speak your language because I have Individualization number two, just as you have. Lisa Cummings: So you can riff with me; I like it. I’m this ideas guy (Ideation), I like to talk and brainstorm and be philosophical. People with Achiever, unless it’s balanced with some other themes… they don’t really have time for that, and it’s that awkward moment that I just now know to be able to say, “Hey, if this isn’t of interest to you, I’m not going to try to slow you down,” because I know inside of their head is this need to get things done, to rack up points by crossing things off their to do list, and I don’t take offense to that and I’m trying to tailor myself to their need. It amplifies that point you were making about when you work with people and you understand not only your themes, but you understand their themes, then you’re able to really get the relationship to be optimized better. Lisa Cummings: Yeah, I totally agree and I think it’s one of the most useful things. When you have that person at work who frustrates you, it’s that moment where you can go, “Alright, I know their talents now. Their talent themes are this, this, this, and what are they likely thinking about right now?” You’re making up a hypothesis but by knowing the talent themes and by knowing the definitions you can really start to make some good guesses about what they care about and how they process the world, and then instead of seeing them as annoying teammate, they can become the, “Well that person’s bringing a perspective that is actually really useful to the team, and although it’s not my favorite place to spend my head, and it would be painful for me to live there, that’s where they live.” I think it helps people. Sometimes it’s just tolerating each other when they didn’t before. Sometimes it’s appreciating and partnering way more than they ever thought they would or could do. Then when you get really deep, you start to get an eye for what’s working in the world. I always call it, notice what works to get more of what works, and you start to see, “Oh yeah, that must be what it’s like for them, that really works in this situation.” Then you can leverage it more and actually get more productivity out of it for the team. Adam Seaman: All of that is great. If you get an appliance and it comes with a user’s manual, and it describes here’s how you use this appliance, and here’s what you don’t do with this appliance, and here’s how you get the most life out of it. We as individuals have user’s manuals, except they’re not written. We have to work with somebody or marry them or live with them for years to just even get a glimpse of this is how their user’s manual works. But if I know someone’s top five StrengthsFinder themes, I’m going to have a really good sense of what’s in that instruction manual. The idea is, understand your user’s manual and understand the people around you’s user’s manual, and you can find ways to best work together. Lisa Cummings: I love that you raise the idea that these are patterns of thoughts and behaviors and feelings that come naturally to us. Sometimes they’re going to serve us, and sometimes they’re not. I know my Maximizer gets me in trouble all the time, and when I over commit and I start to see my calendar get so overloaded, I realize there is a drive in me, and I feel that it comes from my Maximizer talent, because it wants to keep making everything better, so there’s always something else I’m adding to the list or trying to tweak or trying to create this new thing or develop a new product or whatever it is, it’s unending. Once you can name it and say, hey that’s the one that’s talking, you can narrow it down and strategize more easily than when you feel spazzy and out of control. Adam Seaman: There’s so much to talk about here, this is where I geek out on this stuff. I want to make sure at some point we talk about why your top five themes or why your StrengthsFinder results are not actually your strengths. You definitely touched on it there with what you just said, so I want to circle back. I’m also mindful that you asked me a question that I haven’t answered yet, which are what are my top themes. I’m happy to skip it, but I don’t want your audience to think that I was just ignoring you and I’m a rude guest. Lisa Cummings: You’re such a kind guest. What are yours? Adam Seaman: My number one is Strategic, as you mentioned earlier. I already talked a little bit about that one. My second one is Individualization, now is that your number four? Do I have that right? Adam Seaman: Okay. So Individualization is this quality of looking to tailor things to the person, so I don’t like doing things en masse, and your Maximizer theme is more likes to do things in block operations and very efficient, whereas the Individualization theme is one-by-one, case-by-case, what’s unique about this person. My number three is Ideation. This is a quality of always wanting to think outside the box, so sometimes in my mind ideas start flowing and I call it popcorning because when I get in this mode, when you’re making popcorn that point where the kernels start popping really fast. That’s kind of what it’s like in my head, it’s like an explosion of ideas, and I get really excited by it, things are really best for me when I can be creative and original, and I don’t like doing things by the book. So that’s my creativity theme there. Adam Seaman: Yeah, one of those. Lisa Cummings: This is one of my favorite ones when teams are together and they talk about some of these things that their talent themes might lead them to do or think or say or look like, I love asking that question. Focus is a good one, that’s my number six, where people talk about the mode they get into when they’re in their Intellection mode or they’re in their Focus mode, then I ask people, “What does that look like on you? How will your teammates know?” Just hearing the story you said, is exactly what it sounds like in the trainings, where people go “Oh, that’s what he’s doing. Now I get it, and now I know when he made the crash-your-party-face, that’s what that means” and it’s so insightful to know that about people that you actually need to be productive with every day. It’s like having magic secrets to the universe. Adam Seaman: Right, it’s kind of like that self-world concept I was talking about. To somebody looking at me it might look like, Adam’s not having fun, maybe somebody has Includer, and they want to make sure that I feel part of the group. To them I don’t look very engaged, but what they can’t see is that I’m at my most engaged when I’m in that space. Now if somebody knows I have Intellection, they won’t be as off-put by it or as concerned about it. I know time’s ticking here, so I’ll go onto my number five which is Input, and this was the hardest one for me to understand. We use the word Input like let me have my Input or let me give my Input, as something you put out into the world. This is one of the reasons why you really have to understand Gallup’s standard definitions for the themes, because sometimes the label doesn’t fully describe what the word is about. In fact, most of the time they don’t. They don’t give you enough context just looking at the word, you really have to understand the description. What Input is, is it’s not about what I put out into the world and give my Input, it’s what I Input into myself, it’s what I collect. One of the things I learned that was very useful from the master StrengthsFinder coach, Curt Liesveld, is he said, “What you collect are things you deem to be useful or that have utility.” It was really cool because what I collect, and it varies person to person. I collect quotes and I collect theories and models and tools and concepts; I love that stuff. I’ve developed a really good sense for what’s a useful quote or what’s not, or what’s a useful model or concept and what’s not. I’ve learned how to use my Input theme a lot better, because I understand it a lot more. There’s a lot more to say about each one of these themes, but those are my top five. That’s all I stayed with for the longest time, but I’m starting to really appreciate the value of looking into your top 10, your number 6-10 themes, because it’s kind of like a basketball team and your main players fall out, they’re either injured or they’re not the right player for the situation. You can go to your bench and bring in a specialist when you need it. You can start to see traces of someone’s themes and how they communicate and that’s when you really start to feel like you’re getting to know this tool so well is when you can hear vespers of the different themes. So Command is my number seven, Activate is my number eight, Empathy is my number nine, Futuristic is my number ten, and we just hit 30 minutes in six seconds. Lisa Cummings: Look at that, you are so precise. I’m still standing back thinking, I’ve never heard the word vespers, it sounds like a funny pronunciation of a Vespa scooter, and that’s a clue of Intellection right there, or my lack of. Let’s end this show with your view on talent and strengths. Adam Seaman: So good. Here’s the big secret about StrengthsFinder, or one of them, because there are several secrets. Adam Seaman: Did you just say “Ooh”? Lisa Cummings: Yeah. The more you listen, the more you learn. Adam Seaman: [laughing] That’s great. When you take the StrengthsFinder, one of the most powerful insights is to realize that your top five, these 34 themes of talent that StrengthsFinder measures, are not strengths. It gets into the definition of a strength, and the definition of a talent. A strength is an activity in which you have consistent, near perfect performance. So you do an activity regularly with high quality. That’s when you know you have a strength, and this is Gallup’s definition for a strength. I’ll come back to that, because we’re going to break it down. Lisa Cummings: Break it down. Adam Seaman: [preparing to beatbox] We’re going to break it down. Adam Seaman: Well, beatboxing would be, if I could do it consistently and near perfectly would be a strength, but it’s not. It’s less than a strength. So a talent, and these themes of talent, the definition for those is this: a recurring pattern of how you think, how you feel, and how you behave that “can” be productively applied. I put the can in quotes because it can be productively applied, this pattern of thinking and feeling and behaving, but it can also counter productively be applied. It’s not always productive. Anybody listening could look at one of their themes and say, “Yeah that theme sometimes gets me into trouble.” Sometimes it’s not productive, it’s counter productive. Let’s take a theme like Positivity, your number three. What could possibly not be great about Positivity? I’ll just ask you Lisa, are there times where Positivity is not acting in your best interest? Lisa Cummings: I’ll tell you the most trouble I had with my Positivity talent theme was, early in my career as a manager, I realized that people started responding in a way that led me to believe that they thought I didn’t think through issues, that I was giving the Pollyanna view of what we were going to do and that naively I was leading my team forward through some decision without any thinking behind it, the [rah rah voice] “Oh yay we’re going to do it, let’s go”. I realized I needed to actually say the decision factors out loud, because maybe my excitement, maybe my energy level about a change, and I’m always thinking about messaging something and how to get people to a new future…so I see how that could all get really blurry and lead people to think that the substance is lacking behind it. With my Strategic talent theme, I’m thinking so quickly through those things, I might need to catch people up to “Oh, okay, look here was my thought process, there were a lot of factors in the decision, I considered X Y and Z, I realize there are a couple of risks associated, and this is the decision and then back to the yay-part.” Even though it doesn’t really sound like that, I realized I needed to actually acknowledge either the thought process or the risks that had been considered, or the facts behind things so that people didn’t assume I was trying to play team cheerleader with no substance. 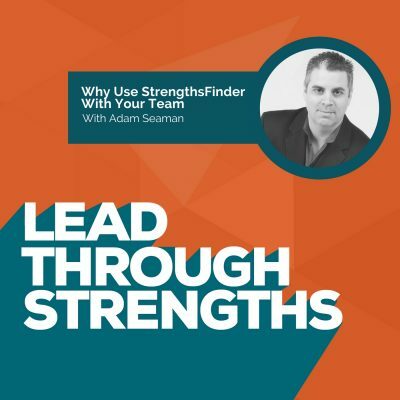 Adam Seaman: Yeah, see it’s that kind of insight that I think StrengthsFinder can help reveal, that you might not have ever had in any other way. You have this pattern called Positivity that allows you to take any situation and identify, almost like a reflex, whatever the situation is, your immediate reflex is to say, “Well what’s the upside?” or “This is a good thing, because of this…” That pattern is going to play out, it’s going to do what it’s going to do, and then sometimes that pattern is going to be the perfect match for the situation. Positivity is my number 32. I know that for me, there are many occasions where I wish I had that ability to see the upside; it would have helped me persevere more. So there are times where that theme of Positivity is the perfect match for the situation. The point is that, this is true for any of the 34 themes, that they are patterns that play out in us, they’re patterns for how we think, how we feel and behave, but our situations that we’re in are always changing. That pattern in one situation may be a huge benefit, but in another situation it would be the last thing you want to have happen. That’s one reason why our themes of talent, our top five that we get from StrengthsFinder, they are not strengths yet. There’s a lot more to say on this, but I want to pause and see if you have any thoughts on that. Lisa Cummings: Yeah, I love the way that you describe it. The part that you said that really got me there, that I thought was cool was, “Look it would be kind of sad, if you got your report and you had nowhere to go, because you’ve arrived. You have your strengths. Voila. You’re done.” But instead, if you realize, “Okay these are your talents, it’s telling you about your natural patterns, there’s an infinite amount of stuff to go do to nurture them, to feed them, to make them get applied in a work situation in a way that really serves you.” That’s the growth part that’s really fun that allows them to turn into strengths so they can be productively applied. What do you think a world would look like if everyone knew his or her talent themes? Adam Seaman: If I’m in a place where I’m being fed, where I’m known for what I’m good at and my teammates are setting me up for success and I’m able to do as much as possible, even though you can’t get it perfectly, but as much as possible I’m able to do the things I love doing, that I’m good at, that I produce good results, that when I’m doing them I feel that flow state where I don’t notice time passing, that that’s what a situation like that would look like. Lisa Cummings: I love that you’re talking about the food element, because when I do StrengthsFinder training, I’m always using the terms starved and fed, because I think the talent themes act different ways, they show up on you differently. If you are feeding them, and you’re nurturing them and you’re working on them, compared with when you’re starving them out or you’re squashing them down because you don’t think they’d be valued in that environment, or it isn’t valued in that environment, so it’s not getting any attention and it’s starved. I think that would be a cool way to end also, to talk about what that looks like on the job, when strengths, when someone’s talent themes are consistently getting squashed or offended or not valued or not used, and how you’ve seen that show up. Adam Seaman: The first thing is, you have to recognize in yourself what is your state of happiness or satisfaction? Then realize a couple things. One is something I heard called the law of two feet. The law of two feet says if you don’t like something, if you’re not in a good place, relocate. Walk away, go somewhere else. That’s the promise that I see in StrengthsFinder, is that if people really embraced it as more than an assessment then they could really help each other find that better fit. Like as a manager, I could see that hey, this person is struggling here, what can I do to shape their job a little bit more so it plays more to what they’re like. It’s not like you totally have this complete makeover, but a little bit at a time, you could shift your environment so you can free yourself up from the things you hate a little bit at a time to spend more time doing those things that you really enjoy. As that happens, you increase your value. Lisa Cummings: As a people manager, there’s a lot you can do to shape and continually shape the job of people on the team by individualizing a little bit at a time. It’s not to say that this is a custom job for everyone, and I can afford to make yours exactly what you’d like it to be. We know that the business world isn’t like that; you have a corporate strategy, you have business objectives to meet, and inside of that there’s a lot you can do to shape the rule to match the person on the team. As a person, I love that you are highly accountable with the law of two feet because it’s up to you, this is your career, your life, and you get to shape it a little bit at a time until it is what you want it to be. People have a lot more leeway to do that than they often give credit for. I love to quiz people when they push back on that, and I ask them about the job description when they got hired and say “Okay, remember back to the job description, now how many people in the room have the exact same tasks and responsibilities as when you were first hired into that role?” Even though many people have only been in that role for 18 months or some short time, they laugh and say “Oh, no, it’s significantly different.” There you go, proof positive. Rules shift and change all the time, so why not be actively shaping it towards the activities you enjoy, the way you want your personal brand to show up in the world and at work, and if you’re consciously going after, and even sharing with your manager, “Hey, I’d love more opportunities in this area. If a project comes up, please consider me.” It’s making them aware, because managers aren’t mind readers. They don’t know that person’s interested in it. So having StrengthsFinder as a language for describing an aspirational work place they’d like to live in, things they’d like to see more of, it can be hugely powerful in the way that tasks are assigned and projects are given out person to person. Adam Seaman: [Emphatically] Truth. You want to find, what is the highest best use for the qualities that you possess. Lisa Cummings: And if you help your teammates produce at their best, obviously you’re going to meet your goals in a bigger way, your business is going to be more successful overall. Also day to day, you’re around people for, if you’re physically around each other, you’re around them for eight hours a day or more, so wouldn’t it be better if you helped people and supported them, if you knew their talents, if you did the Freaky Friday, to call back to that. Then you could support your teammates in becoming their best, and that would also help them, help the business, and help you not be around grumpy people all day at work. Adam Seaman: That sounds like a great final note to end on. That’s a drop-your-mic moment right there. Lisa Cummings: It’s a good thought for bringing it all around. Adam Seaman: [rapping tone] So you need people to check themselves before they wreck themselves. Lisa Cummings: Yes, back to a rap as well. That’s where we’re going to drop the mic. It’s been such a blast rhyming with you Adam. Adam Seaman: This flew by so fast, and it’s because we’re playing to our strengths. We’re both talking about something we love and we’re passionate about, and so I hope that as a result, some other people are getting green lit about StrengthsFinder. Lisa Cummings: Yeah, that’s the ultimate call back as well. So getting green lit, I don’t know what they’re getting bit by, but they’re getting green lit. Adam Seaman: They’re getting bit by the strengths bug. Lisa Cummings: Yeah, bit by the strengths bug. We’ll link to Adam’s company, Talent2Strength, so that you can look him up and see more. With that, remember, using your strengths makes you a stronger performer at work. If you’re putting a lopsided focus on fixing weaknesses, you’re probably choosing the path of most resistance. Instead, claim your talents and share them with the world.